I remember the first Earth Day. I guess that dates me, but I feel privileged to have witnessed the formalization of the embrionic environmental movement on April 22, 1970. Each of the following years has brought both veneration and abuse to the earth in seeming equal amounts. Although I've had my share of "movement" experiences, these days it feels more important, environmentally, to focus on my own personal practices, like how I garden. 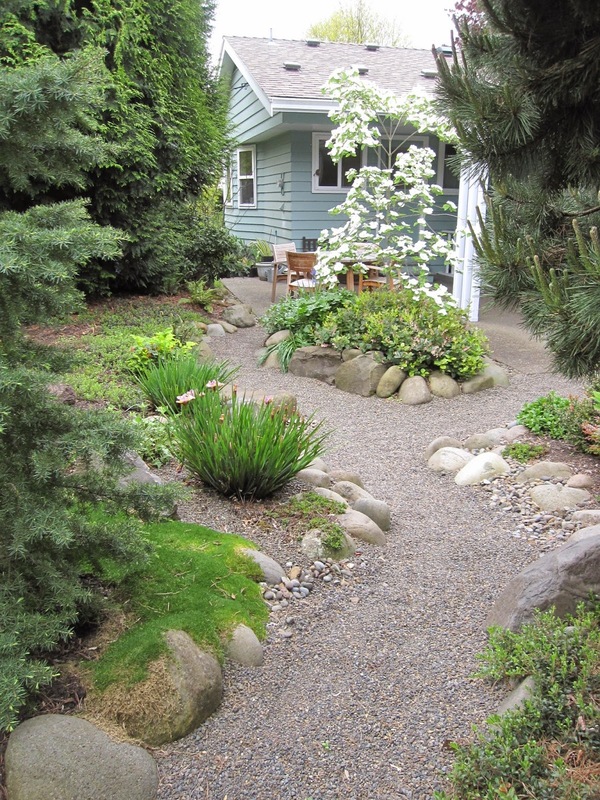 The Mulch Man does the same, and what we refer to as the Northwest Territory is his homage to the green, native environment he loved the minute he arrived in Oregon. I love pushing the zonal envelope, but I do try to grow plants that need less water. Sometimes I bring those drought-tolerant plants home for the Northwest Territory, too. It's been 45 years since that first Earth Day. Have we learned the lessons we should have? Are we staying open to the new environmental lessons? I know we are enjoying the beauty our earth and our garden can show us. Our regional natives are happy and flowering. The Northwest Territory rewards us with little signs that we are on the right track, like these volunteer sword ferns. New growth on the Mountain Hemlock is tiny but positive. A volunteer Lewisia columbiana var. rupicola still thrives after appearing last summer. On this Earth Day in 2015, I feel a kind of peace in the quiet Northwest Territory of Longview Ranch. I hope your Earth Day is equally rewarding. Here it is, the Ides of April. Since I've already (just barely) filed my taxes, I'm free to indulge myself in the blooms of April at Longview Ranch. Here's what's looking flowery. Lewisia cotyledon 'Sunset Series. They're not as full yet as in my header picture, but they're still a great hit of pink and orange. I have other Lewisias, but the L. cotyledon 'Sunset Series' are the first to flower in my garden. I'm not sure whether I like the flowers or the foliage better on Loropetalum chinense 'Sizzling Pink'. It lights up a shady corner of the back garden beautifully. Inherited Camellia japonica still making blooms. Our cool spring is helping keep it that way. Primula sieboldii 'Lacy Lady', looking a little dissonant beneath the Camellia pictured above. Just don't look at them together! Armeria maritima 'Victor Reiter' is a tiny attention-getter. Helianthemum 'Henfield Brilliant' looks a little droopy here because I shot this at the end of the day, when the flowers were closing for the night. It's actually having a good, flowery year. One of my favorite blooms, Halmiocistus wintonensis 'Merrist Woods Cream', is just breaking out. 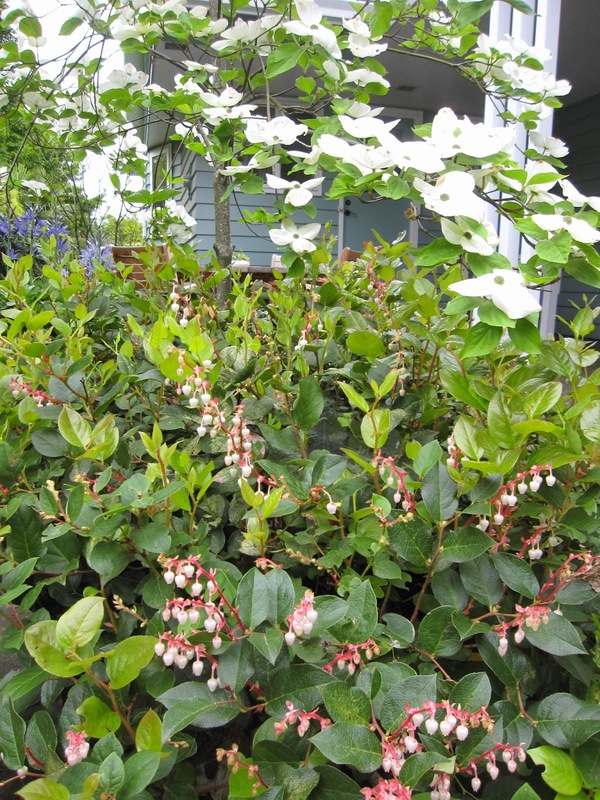 With the predicted dry and sunny days coming up, this shrub will soon be covered with these dreamy, creamy flowers. 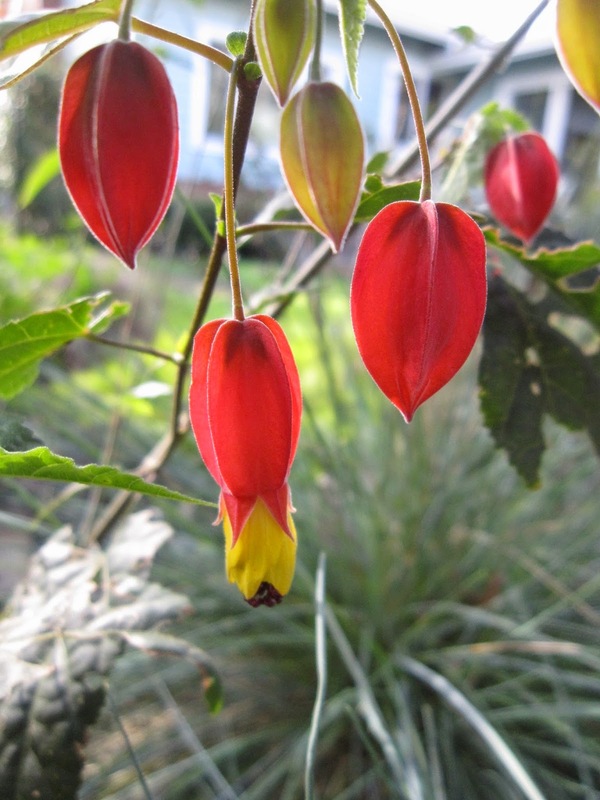 Abutilon megapotamicum is so much earlier this year, probably due to our mild winter. This is the second bloom on this yellow rose - the first opened about a week ago. My lack of affection for the inherited roses is well documented, but I offer this image in the spirit of proper recordkeeping. Corydalis flexuosa 'O'Byrne Blue' is a gorgeous azure against a carpet of Lysimachia nummilaria 'Aurea'. My Olea europea 'Arbequina' has its usual buds galore, but we'll see if they get any better pollination this year: last year resulted in just five olives. I'm ready to get out the paintbrush this year. One of two Pieris japonica 'Prelude' from Roger Gossler's visit to the Xera Shop a couple of weekends ago. I always kind of took Pieris for granted in the past, but both plants of this very small, low cultivar are covered with blooms and perfect for our expanded shady bed in the front garden. Fothergilla gardenii 'Mt Airy' is unfazed by the regular rain we've had over the past few weeks, and continues to bloom. I guess I should be glad it's been relatively cool and wet, so I can enjoy the blooms that much longer. Last, I can't stop admiring the showy bracts of Cornus 'Eddie's White Wonder'. They're lovely during the day, but even better at dusk when the flowers are suffused with an unearthly and beautiful glow you just have to see to believe. And that's it for my Bloom Day. This monthly look at what's blooming is hosted by Carol Michel at May Dreams Gardens. She has lots more to see if you click over there. About a month ago, I took a Sunday morning urban hike that included newly-developed public walking areas along Portland's South Waterfront renewal area. Although the paths were open, the planted areas were newly completed and were still fenced off. Vaults were sunken into the waterline to hold shrubs and stabilize the shoreline. A wide path ran all the way down to the river. I guess you could portage your canoe down and launch it here. There's very little of the industry left, but this part of the riverfront was formerly a significant ship-building area. I liked the reference to ship hulls in the steel used to retain the grassy slope. I'm not so sure about the message in this sculptural assemblage: The drifting nature of humankind? Man-made forms ensnare the natural world? There was no name or artist plaque to help with interpretation. I liked the loose cabled ties holding it all together. We're getting used to seeing gabions used in atypical situations. Here they're completely functional and fit right in with the industrial feel of the waterfront. This good-sized Arbutus menzesii looked to be in good health. But a few of the trees looked like they might have died after being planted. Fingers crossed it was transplant shock and they'll come back as spring progresses. 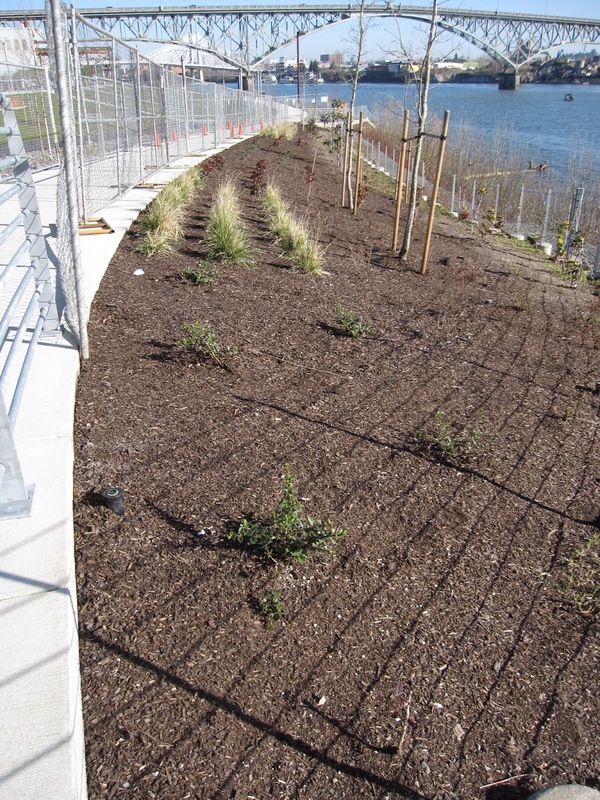 Most of the plantings appeared to be natives and riverfront species. Right now, there's a lot of rock and a lot of paving, but the plantings will green up and gradually fill in. And as much as Portlanders love their Willamette riverfront, I'm sure by the time summer comes, this fresh expanse of grass will be covered with people, kids and dogs, and strollers, runners and bicyclists will be filling the paved areas.